Charge or sync your Apple devices, even when inside a protective case. The USB2ADC1MB 1-meter Apple 30-pin Dock Connector to USB cable for iPhone, iPod and iPad is colored to suit black mobile devices and provides reliable connectivity of your iOS-enabled mobile digital devices to your computer, for syncing and charging.Plus, this uniquely constructed Dock Connector to USB cable features a stepped Apple Dock Connector, designed by StarTech.com, which unlike a regular connector plugs into your iPhone, iPod or iPad, even when inside a protective case while avoiding the inconvenience of having to constantly remove the cover for every charge/sync.If your computer USB port does not deliver sufficient power and you see a "Not Charging" message on your iPad or other Apple device, you can use this 1m 30-pin Dock to USB Cable with the USB 2.0 Fast Charging Adapter (USB2CHADP) in order to fast charge your devices. 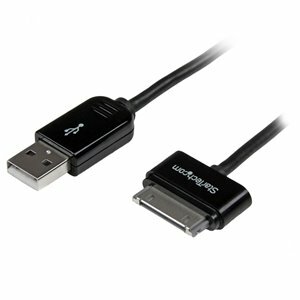 This 3.3 ft / 1m black, Apple 30-pin Dock Connector-to-USB cable suits the needs of most iOS-enabled mobile digital device users. The stepped connector design allows you to plug into your device even while inside a protective case. The standard length makes it a perfect replacement for your damaged or misplaced iPhone, iPod, or iPad cables. And it is colored to suit your black mobile devices. Stepped Apple dock connector connects to your device even while inside its protective case - avoiding the inconvenience of having to constantly remove the cover for every charge/sync. Our complete selection of USB-to-Dock Connector cables for Apple makes it easy to charge or sync your iPhone, iPod, or iPad in all situations. We offer a wide selection of unique cables in a variety of lengths, short and long, including angled cables, to suit any application perfectly. All of our 30-pin Dock Connector cables are certified to Apple MFi Standards and are backed by our lifetime warranty to ensure dependable performance. See below for our full selection of iPhone, iPod, or iPad cables to meet the needs of your different applications.